Sightsailing strives to give you a fun sailing experience and show you the best of Newport. in Newport offering both regularly scheduled sails and private charters to the public. Sightsailing Inc. was started by John Hirschler, who still works here almost every day. John is a native Newporter who was lucky enough to be introduced to sailing by his parents in their Pearson Ensign and Herreshoff Bullseye. 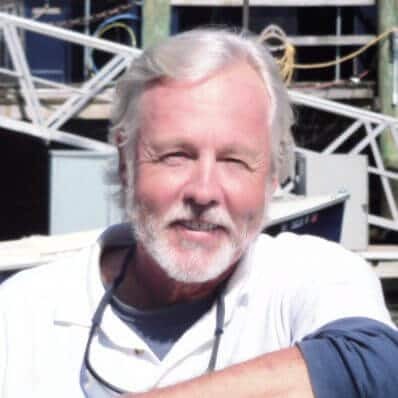 Like many local youngsters bitten by the sailing bug, he sailed summers in the Newport Yacht Club Junior Sailing Program, going on to race dinghies and 420s all over Narragansett Bay. After graduating from Boston University and a stint of office work, he decided it might be a good idea to start a business before returning to business school. John started Sightsailing doing all the sailing himself in a 22 foot Pearson Ensign while his girlfriend ran the ‘office’…basically a phone, tattered notebook and a rickety chair. After a season or two, John added another boat, and then a few more. He received his MBA but decided that even though it was a boatload of work, he really enjoyed running his own business and "messing about in boats." John's a serious "boat-junkie" who likes nothing more than strolling through boatyards looking at boats. In the winter, John can be found covered with muck in the boatyard, reading the Sunday New York Times, dreaming of visiting far away places and catching up on everything that got put on the back burner during the sailing season! If you have read this far and want to know more about John, scroll to the bottom of this page and watch our History video. Favorite Quotation:"You win some, you lose some and some get rained out, but you gotta suit up for them all." J. Askenberg. Originally from Pennsylvania, John Hughes spent many summers in Rhode Island before becoming a year-round resident in 1996. He grew up around boats and learned to sail by age nine. He has raced dinghies and keel boats on Narragansett Bay. He has cruised in the coastal waters of New England and on the open ocean. He has also spent several months as a deck-hand on a salmon troller in southeast Alaska. John has worked for Sightsailing in alternate summers since acquiring his captain’s license in 1994. In addition to sailing, John loves traveling. He spent nearly seven years overseas (including four and half years in Japan), and he has visited over twenty-five different countries. 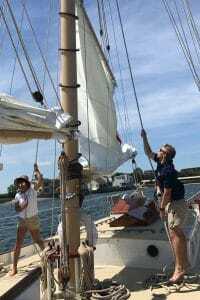 When he is not working for Sightsailing, he and his wife like to sail and race their Pearson Ensign out of Wickford, RI. From September to June, John teaches history at the Rocky Hill School in East Greenwich, RI. With a name like Ed Early, you can bet that Ed will always be on time. Ed's sailed here so long we're not even sure when he started...9 years ago? Maybe 10? Anyway, Ed is our primary Starlight captain and does a really nice job running the boat. He knows every inch of Newport Harbor and all of its history. A former instructor for Offshore Sailing School, Ed is always happy to give his guests the helm or have them just sit back and relax. Ed hangs his hat in Newport for the summer and then migrates to Florida for the winter. Ed's extraordinarily well read and a tennis pro. We'd wager that he would destroy any of us on the tennis court. 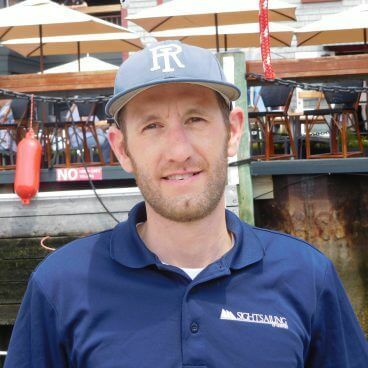 Kyle grew up in North Kingstown, RI and learned to sail and race at the Wickford Yacht Club beginning at at the tender age of 6. 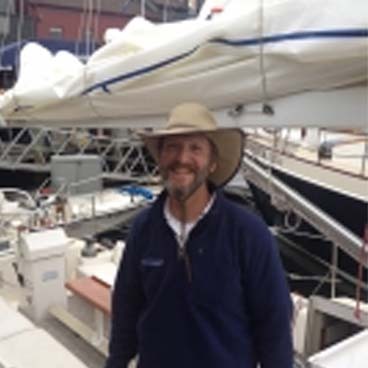 Kyle has sailed aboard both racing and cruising boats of all sizes in addition to his family's boats. Kyle holds a B.S. from the University of Rhode Island and a Master's Degree from Roger Williams University. 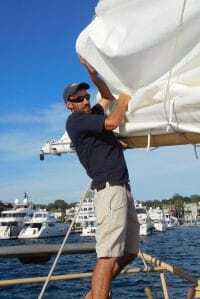 After many seasons as a boat captain and the youth sailing director at the Barrington Yacht Club, Kyle spent a summer sailing as crew aboard Aquidneck and then obtained his captain's license. Kyle runs Sightsailer during the summer. In the off season, he is in his tenth year as a 4th grade teacher. He currently resides in Wickford as the only male between his wife Kaitlin and three daughters, Emily, Maggie and Hadley. When a man shows up for his job wearing a ball cap embroidered with a bicycle that reads: "Livin' the Effin' Dream" you know you've probably met an interesting guy. Tyson has bicycled all over the world including long distance treks to Japan, New Zealand and just this winter, a long trek down the Baja into Mexico. Let's just say he's a serious bike-junkie. 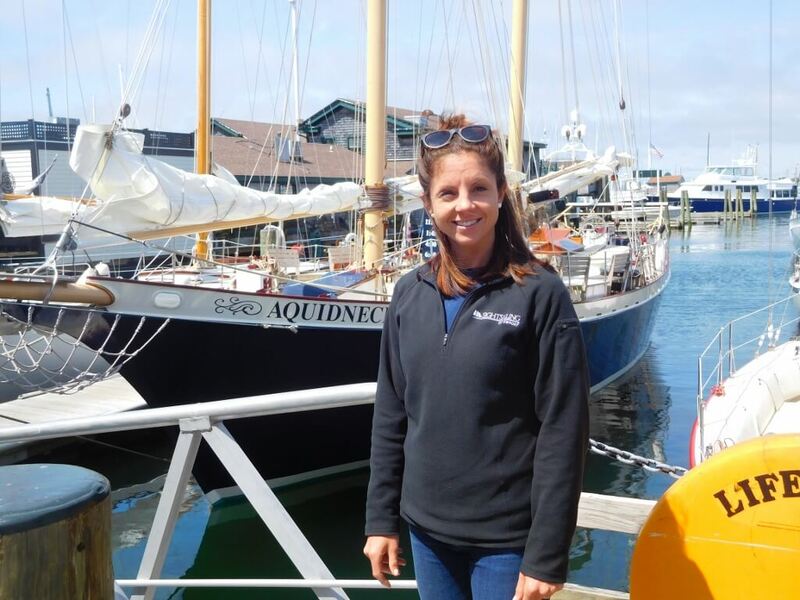 Tyson has sailed aboard Aquidneck on and off since 2008. Like most of our captains he started out as crew and worked his way up to captain. 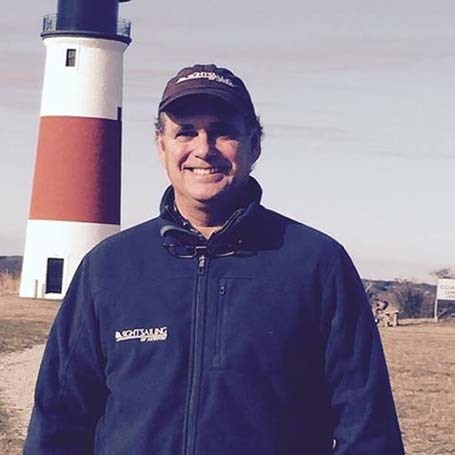 Referred to as "The Minister of Narragansett Bay" by one of his sailing school students, Tyson knows the history of every sight and is extremely knowledgeable about the coastline, bay, ocean and issues affecting them. 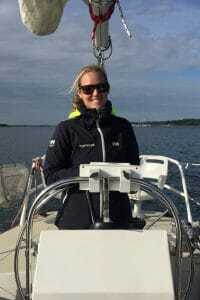 He has sailed on boats ranging from Lasers, 420's and FJ's, to J 22's, SEA sail training vessels including the Corwith Cramer and Robert Seamans and even a stint on Dodge Morgan's solo round the world boat, Americian Promise. 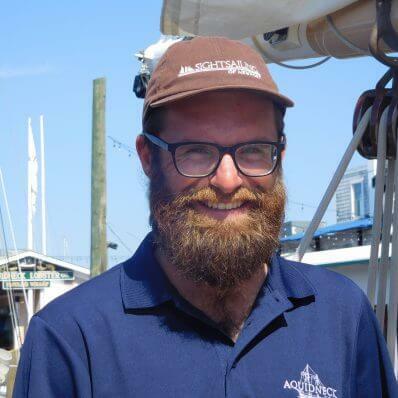 His past work experience includes sailing instructor, fisheries observer and serving as the Sustainability and Educational Program Director for Sailors for the Sea. In his off time you might catch him rebuilding a bike to give to a friend, or picking plastic out of the harbor. This section would not be complete if we did not pay homage to the people who really do the heavy lifting around here: the crew and the front desk team. The front desk team is the one who answered your phone call, explained our different boats, booked your reservation and greeted you upon check-in. They also wear many different hats, sweat all the details, tackle a multitude of office tasks and are the glue that holds this place together! The crew aboard Aquidneck and Sightsailer are also phenomenal. Every season we get a boatload of applications from all sorts of people: college sailing team skippers, merchant mariners, teachers, boat nuts, you name it. We try to hire people who not only know how to sail, but really like working with people. Our crews are the ones greeting you, raising, lowering and trimming sails, pointing out sights, ensuring your comfort and sharing their knowledge of Newport with you. They have the largest impact on your experience and always try to do an outstanding job! Courtney K, also know as 'Special K" for her MacGyver like skill set, ability to figure out the impossible and accomplish the toughest tasks, tackles all sorts of special projects and helps hold down the Front of the House. With a degree from Boston College, experience with small business startups and gas volume analysis in the energy industry, Courtney brings a wide and diverse skill set to the job. No task stumps her. She's curious and loves a challenge. When she's not juggling an incredible number of odd-shaped balls for the boss, you'll find her running (and winning) triathlons, putting her posse of clients through high intensity exercise routines, skiing, surfing, making unbelievably good and creative food, or relaxing with her friends while enjoying a Mudslide on Block Island. Now in her third season with us, Laura helps run our sales and reservations front desk. When we hired her, she told us she'd had a near death experience sailing as a kid so we said "Fine, we'll keep you at the desk." And are we glad we did! Smart as a whip and cool as a cucumber under pressure, Laura knows all of the processes and policies of running the business like the back of her hand. She is an accomplished film maker and photographer and along with Bella, helps run our social media accounts. 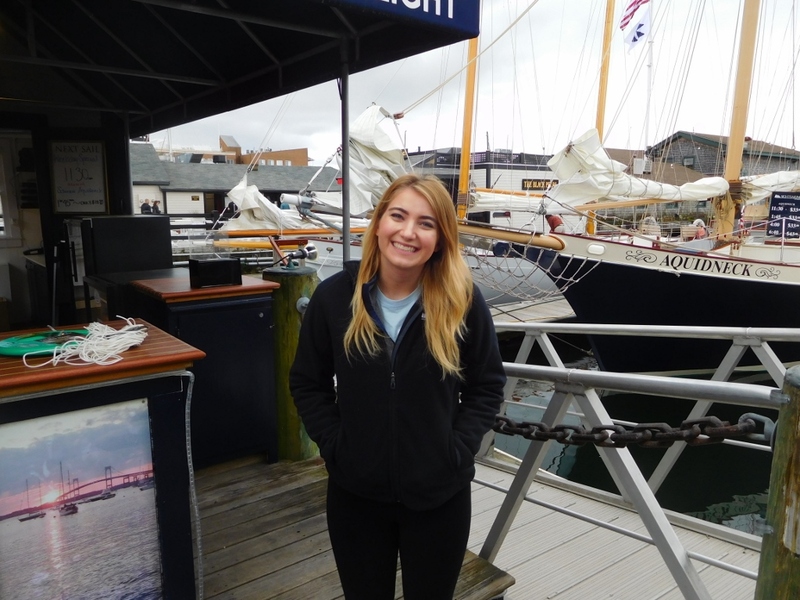 Laura grew up in South Kingstown and is a biology major at the University of Rhode Island where she is the Pan-Hellenic president of all sororities on campus. On her rare days off, you'll find Laura enjoying the beach, reading, travelling and enjoying all Rhode Island has to offer. Isabella J, better known simply as Bella, helps run our sales and reservations front desk. Bella grew up a military brat and has lived all over the world including Naples Italy, Kings Bay Georgia and luckily for us, Rhode Island! When she interviewed with us, we didn't hesitate to bring her aboard. She wasn't walking out the door without an offer. Unflappable and graceful under pressure, Bella knows all the ins and outs of running the front desk. Along with Laura, she's the one who may have booked your tickets, greeted you at the dock or provided helpful information. Smart as a whip and multi talented, Bella helps run our Instagram and Facebook accounts and helps out with a myriad of back office tasks. When she's not working, you'll find her walking her Boxer Diamond, relaxing at the beach, eating oysters or sipping an Espresso Martini.